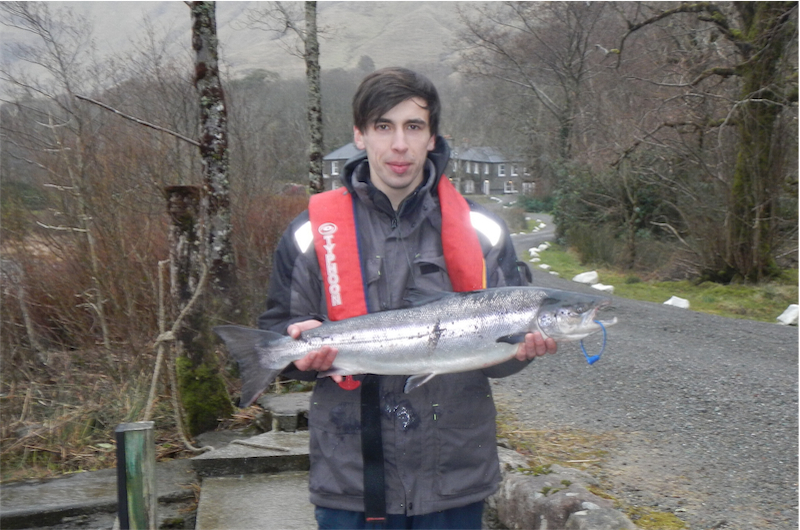 Delphi had it’s second fish of the season when 17 year old Colm O’Leary landed his first ever salmon, a fine 9lbs11ozs fish off Finlough on a Collie Dog. It was indeed a real family effort as father Jack, mother Myke and younger brother Aodhan were all in the boat when the fish was landed. The fish was taken inside the stream and after a titanic struggle the fish was finally boated, much to the delight of all involved. I should add my congratulations to all involved, especially as it’s a first ever and a moment that was shared by all the family. I must also mention Gerry Fitzpatrick and his group of some experienced salmon anglers tried hard for three days in the middle of the week. Conditions were quite good Tuesday and Wednesday but then we got another lump of rain on Wednesday night, 64.1mms (2.5 inches) which put the river right up to 90 again, which makes fishing difficult. Having said that I think Gerry and his group thoroughly enjoyed themselves, with great emphasis being placed on the social aspect of the trip which is how it should be. I actually tried fishing myself yesterday for a couple of hours, without success it must be added but did see a fresh fish at the bottom of the Meadow pool, which is the first I have seen there this year.